Notifications in the abode system are defined per user. This allows you to create different notification preferences for each user on your system. 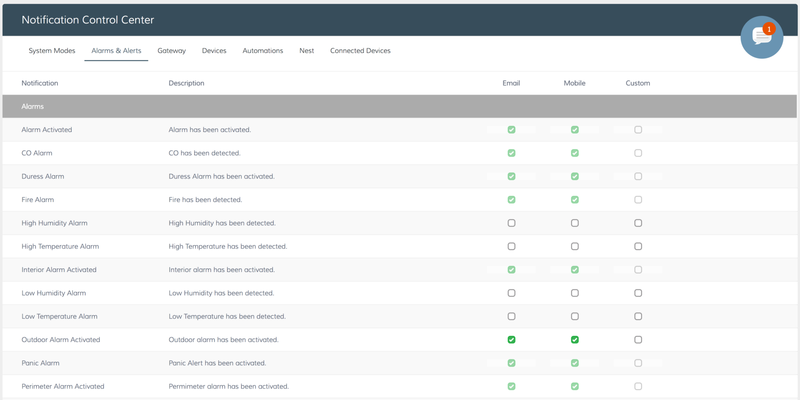 To configure preferences for each user, you have to log into the abode web app as each user, then navigate to Account >> Notifications and configure the notifications as desired. We’ve divided our events in to 6 categories to improve organization. If you have a Nest device connected, you’ll also see a 7th — Nest Category. Connected Devices — allows you to set notification preferences for individual devices connected to your abode system. For example, maybe you have disabled notifications for door open /close events in the Devices section, but you have a basement door that isn’t used often so you would like notifications when it is opened/closed. Located your basement door in the Connected Devices section and configure accordingly. Nest — allows you to set defaults for Nest devices. This tab is ONLY visible if you have a Nest Integration set-up. The abode system currently supports email and mobile (push) notifications. You’ll notice some notifications that appear to be disabled; these events have been deemed critical and need attention as soon as possible. These critical event defaults cannot be changed right now. When a critical event occurs, all users will receive email and push notifications. 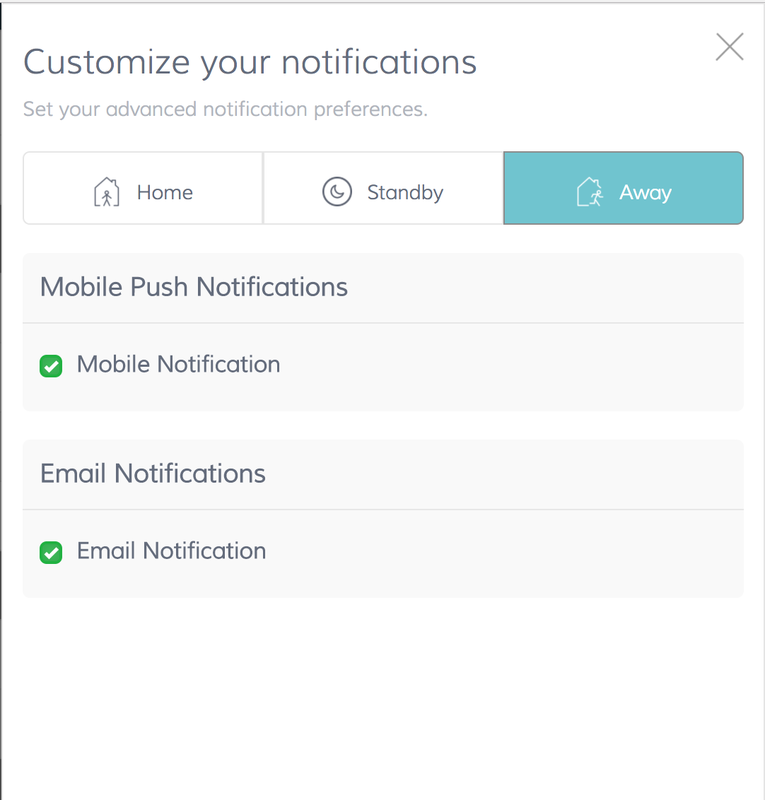 For non-critical events, you can also further customize the notification settings by abode system mode. If you click in the “Custom” column, you’ll be able to define which system modes (Away/Home/Standby) you’d like to receive notifications. Alarm event push notifications have a couple of additional features. Alarm Sound — these events play an alarm sound to alert you quickly that this notification needs immediate attention. Interactive — in iOS and Android, the alarm events are interactive. 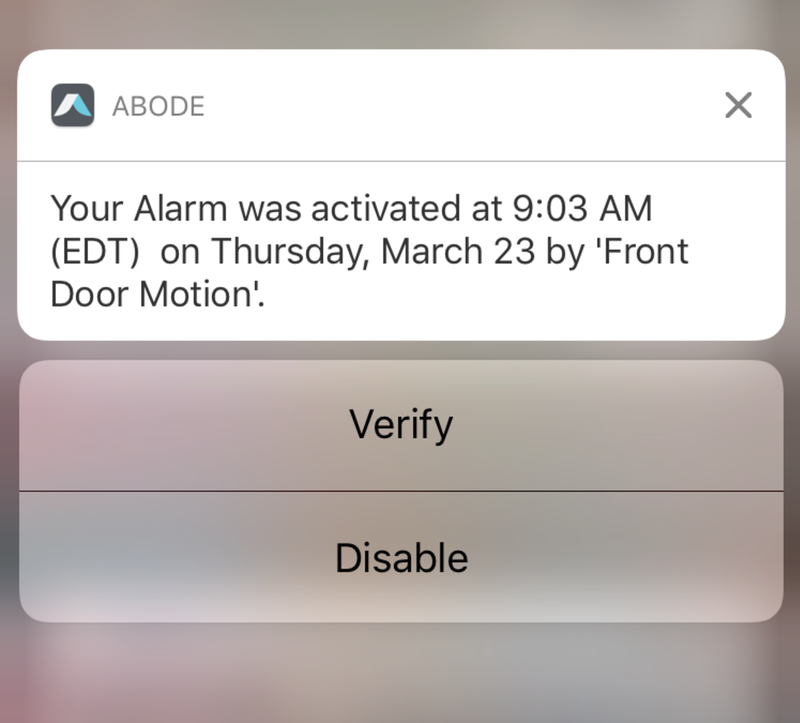 This allows you to quickly Verify or Disable the alarm event without opening the abode app. If you are on the Basic or Connect plan, you’ll be presented options to Disable or Call Police. If you are on the Secure plan, you’ll be presented options to Disable or Verify. In iOS, when the alarm notification is received on your phone, if you drag left and select “View”, you’ll be presented with options based on your current plan. In Android, when the alarm notification is received on your phone, if you drag down on the event, you’ll be presented with options based on your current plan.